These so called “low- velocity injuries” would rarely do any harm to the bone in younger people. 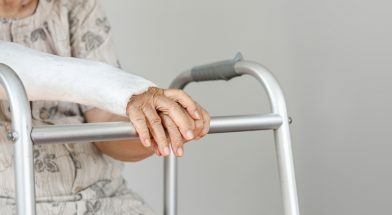 In the elderly however, even this low impact might lead to a fracture or contusion of the bone (“bone bruise”). One factor that increases the risk is impaired bone strength (osteoporosis). A common phenomenon that is possible to treat, but are often only discovered after an injury has taken place. Even worse, there does not even have to be an injury at all. Especially in the spine but also in the pelvis so- called “insufficiency” or “fragility” fractures can occur on the basis of osteoporosis alone. The life- time risk to sustain such a fragility fracture is estimated to be 30 % in men and 50 % in women. Luckily, in the majority of cases a resulting fracture becomes obvious on plain x- ray films, but this is not always the case. Upon seeing the elderly patient after an injury or solely presenting with pain, taking the medical history and undertaking a proper physical examination (location of pain and provocation of pain) is key, however itcan be very challenging for a doctor, thus with a negative X-ray the conclusion might be that there is no skeletal injury. 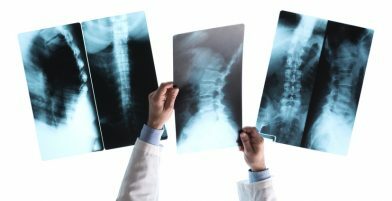 Some experts suppose that up to 1/3rd of bony injuries of the spine are missed. Without proper rehabilitation that can cause some people to suffer for a long period of time, and they might to use pain-killers on a daily basis (which itself increases the risk of falling), as well as suffering from being partly immobilized. So, what to do in order to avoid a worst-case scenario? X- ray is easily accessible and sufficient in most cases. Therefore, it is the first- line but not the most sensitive method to detect fractures. Some fracture lines are hardly to see on x- ray (no matter what x- ray-technique used) as they are only little cracks without any displacement or degenerative processes may have changed the appearance of the bone so strongly that doctors are not able to differentiate between a new and an old injury. 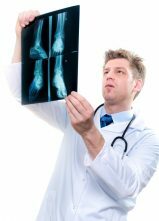 Consequently, if there is a doubt about the reliability of the x- ray result one has to perform further diagnostics instantly or has to assure that the patient will receive it in an arguable amount of time. Further diagnostics in this case mean computed tomography (CT) and magnetic resonance imaging (MRI). CT is capable of detecting even small cracks in the bone but causes more radiation to our body than conventional x- ray. If for example there is still doubt about a possible crack in the femoral neck a focused CT-scan should be carried out. MRI is not helpful in describing fracture lines but can show contusion of the bone (“bone bruise”) as a sign of the impact to the bone. This is especially helpful in differentiating between a new or an old injury. Apart from the fact that there are some restrictions who can go in the MRI scanner there is no radiation at all. Summing up, if there is uncertainty about lesions to the bone ask for diagnostics beyond x- ray. Do not accept long times of immobility without proper diagnostics to look for explanations. Furthermore, to protect us from fragility fractures we have to make sure that we get diagnostics and if necessary treatment of bone loss (osteoporosis) on time, but that is another topic.